Just yesterday, I found myself in the right field bleachers, amongst the Bleacher Creatures, out in the Bronx. Through the first six innings of the game, I was astounded by everything about Luis Severino. His pitch speed blew hitters away. The raw emotion he showed on the mound after getting out a jam reminded me just why I watch the game in the first place. Despite a first inning blunder (giving up a home run to Francisco Lindor to the short porch in right), Severino bounced right back to give the Yankees the victory…while also winning his first Major League start. Severino struck out six in his six innings of work, while walking four and giving up three hits and one run. In four starts, he has given up seven runs total. Tanaka is too valuable to put in the bullpen. Nasty Nate Eovaldi is the darkhouse of the rotation, with a 12-2 record. There’s no way Girardi would mess up his streak of quality starts by placing him in the bullpen. Ivan Nova has a few rocky starts but has proven to be a quality starter as the season goes on. 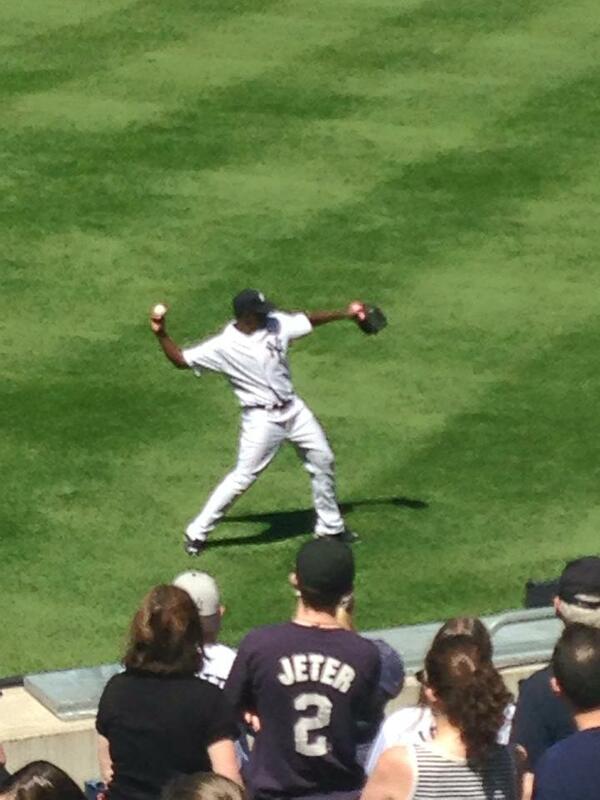 Pineda has had his ups and downs, but shows he has the stuff to be the ace on the staff. And then there is C.C. Sabathia, who has significantly improved in his past few starts. And today, it seems the baseball gods have spoken. With C.C. seemingly down-and-out with a knee injury, Severino will get the shot to stay in the rotation. While nobody wants to see C.C. head to the DL, right now having Severino replace him might be the better option for the Yankees heading into the final stretch of the season. Severino is currently 1-2 on the season with a 2.74 ERA. In four starts, he is averaging six strikeouts per start. He’s given up eight walks in 23 innings pitched. Sabathia, on the other hand, has clearly had more experience and a handful of more starts this season. Sabathia is 4-9 with a 5.27 ERA this season and 113 strikeouts this season. He has pitched better as of late and has shown far more emotion on the mound in recent starts to help provide a spark to the lineup. However, comparing the two…who would you rather have on the mound for a must-win game? Experience or young talent? Most would say experience, but when you’ve got young talent that has proven itself and a veteran who has struggled, it might be the opposite. For me, it would be Severino. He has shown he belongs on the Major League mound and proved that he is worth all the hype. So far in his first four starts, he has outperformed Sabathia in several categories. It is extremely unfortunate for one of the veterans of the staff to go down with an injury that makes fans and coaches nervous, but the positives are we have a replacement who, despite his age, will be able to help the Yankees fight for their playoff spot. Sabathia out, Severino in. Veterans are always fun to watch, but seeing a young phenom live on Saturday showed me that we certainly have something to be excited for come September.